The Canon Maxify series of printers utilise a "Printhead protection system" which means that if any situation whatsoever occurs in which the printhead could be compromised then the Maxify printer goes into lockdown. This means that you cannot access the printer cartridges or change them untill you convince the printer that the printhead is no longer in danger of being damaged. What the Maxify printers actually do is that they monitor the internal pressure of the ink system and the purge pump to make sure that the flow of ink within the system is not being compromised. If the pressure fluctuates too much then it can mean that ink is not flowing through the printhead correctly and therefore the small resistors in the thermal printhead could overheat and actually kill the printhead. Although in theory this is a great set up to protecting the printhead as it is the weakest part of the printer, however it also introduces a few headaches as well. One of the most common questions folks ask is how do I remove the cartridges from a Maxify printer unless they are empty and the printer asks me to change them. Okay so the video below gives you the answer to this problem. Often the Maxify printer wont have any issue as such however it simply wont allow you to change ink cartridges untill it's ready to let you. Take a look at the following video for the solution. 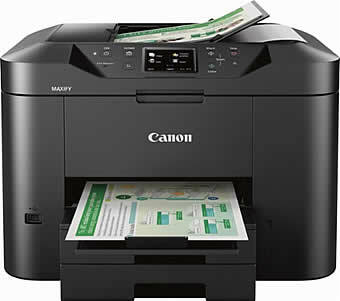 The best way to avoid any issues with the Canon Maxify range of printers is to make sure that you install your cartridges correctly. Anything that compromises the installation of cartridges can cause the Maxify printers to trigger their printhead protection utility. 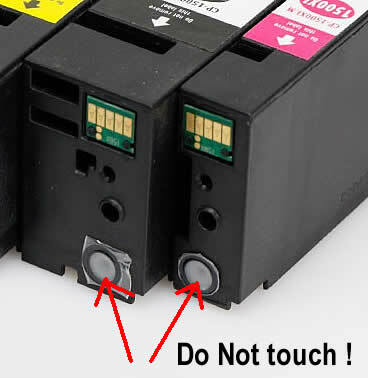 When installing non genuine ink cartridges in the Maxify range of printers you will notice one main difference. That is that the non genuine cartridges have two plastic membranes at the front of the cartridge rather that a valve. DO NOT under any circumstance pierce, remove or tamper with these. When you install the cartridges into the printer, the printer itself will pierce these and cause a tight seal against the printer inlet valve. If you tamper with this seal then the printer may either not print correctly or else go into lock down as the printhead protection cuts in. The reason this occurs is that if you tamper with these then they will not seal correctly and therefore the purge pump cannot pressurise enough to pull the ink into the printhead. Another problem that will occur also if these membranes are tampered with is that the cartridges will leak and also the printhead will eventually clog due to a lack of pressure in the purge pump. Are generic inks okay to use in Maxify Printers? The answer to this is 100% YES. As long as they are installed correctly then they work perfectly well. As with any product make sure that you buy them from a reputable store and also make sure that the ink used in the cartridges is a high quality Pigment based ink.